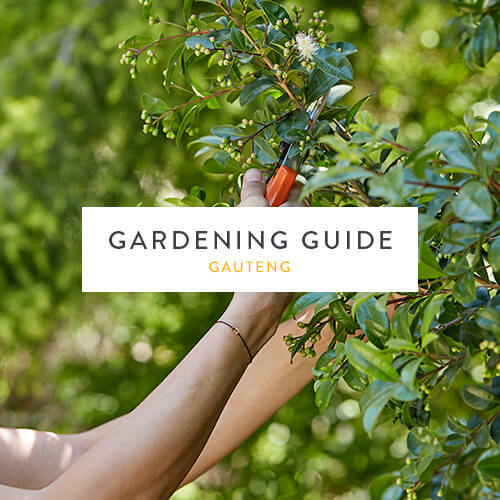 Bask in the glory of your garden in high summer with our Gauteng gardening guide for January. This month we have some seasonal gardening tips and water-saving suggestions to help your garden flourish. Fill empty pockets with colour by planting marigolds and vinca (both water-wise varieties). Plant shade plants such as begonia, impatiens, lobelia and coleus varieties. Summer is a good time to grow your own produce. Plant new crops of radish, lettuce, cherry tomatoes, sweet basil and coriander. Pro tip: Remember to rotate your crops as this improves soil fertility. Feed roses with Atlantic Flower & Fruit to encourage new summer growth. Add compost to roses to improve the condition of the soil and retain water and food. Water full-sun pot plants daily and feed weekly with Multifeed Classic. Shaded and semi-shaded pot plants should be watered every 2-3 days, and fed weekly with Multifeed Classic. Note: Water requirements may differ according to the temperature of certain areas. Ensure you keep most of the watering to the root zone of plants, or install a drip-watering system to feed water directly where it’s needed. Collect and harvest rainwater. Water tanks, inflatable pools and rain chains are all great tools to do this. It’s sufficient to water plants only every three days. Replace lawn with pebbles, gravel or low-water usage groundcovers. Gradually replace thirsty plants with water-wise varieties, such as dianthus, vinca, petunia and gazania.